O'odham, make plans for Cochabamba. Update Oct. 9, 2015: Sadly, there was no response for travel sponsors for these incredible grassroots women. 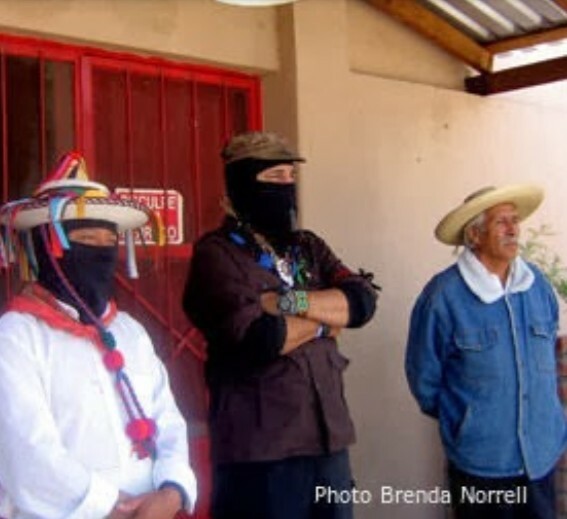 TUCSON -- Tohono O'odham Ofelia Rivas and Dineh Michelle Cook hope to return to Cochabamba, Bolivia, in October and continue the work that they began five years ago when President Evo Morales hosted the World Peoples Conference on Climate Change and the Rights of Mother Earth. 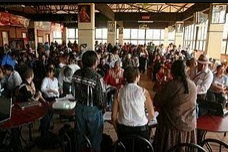 Bolivia is hosting the World Peoples Conference on Climate Change and Defense of Life, October 10--12, 2015, and the women who facilitated the Indigenous Working Group at the 2010 Conference in Cochabamba hope to be there. Ofelia Rivas, outspoken human rights defender living on the border in her homeland, on the Tohono O'odham Nation, is founder of O'odham Voice against the Wall. 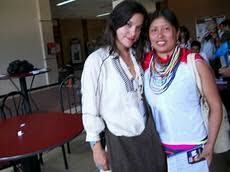 Ofelia co-chaired the Indigenous Working Group in Cochabama in 2010. "Everyone had a voice," Ofelia said, remembering the gathering in Cochabamba. 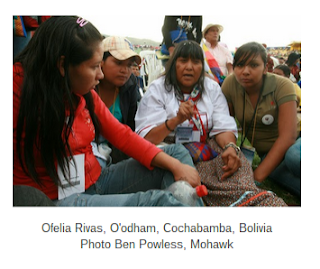 Michelle Cook, Dineh (Navajo) flew into Cochabamba from New Zealand in 2010 and assisted Ofelia with the work of the Indigenous Working Group in Cochabamba. Since then, Michelle received her masters degree as a Fulbright scholar in New Zealand, in Maori and Pacific Development, and completed law school at the University of New Mexico. 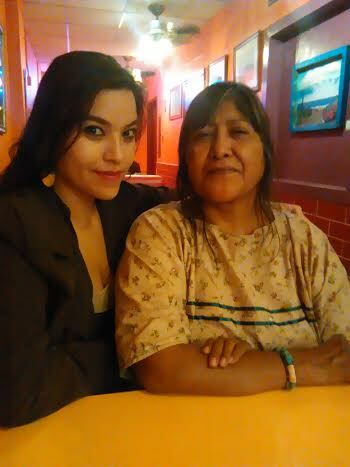 Michelle is currently in the Indigenous Peoples Law and Policy Program at the University of Arizona in Tucson. The upcoming conference in Bolivia focuses on climate, in preparation for the United Nations COP 21 in Paris, and on the concept of living well. The O'odham way of being, Him'dag, and the Dineh (Navajo) way of being, Hozho, are knowledge of living and being, which these women can share at the Climate and Living Well Conference in Bolivia in two weeks. Ofelia Rivas has been held at gun point by the Border Patrol agents. While fighting the ongoing US militarization of her homelands, Ofelia exposed the unearthing of ancestors graves during the construction of the US border wall on the so-called Arizona border. She also led a successful fight against a toxic dump on O'odham ceremonial land in Sonora, Mexico. Ofelia said, "The O’odham way of life is based on the land that has held the remains of our ancestors since the creation of this world. The O’odham did not migrate from anywhere according to our oral history. Our creation tellings record our history and teach the O’odham principles of life. The survival of O’odham today is based in our him’dag." Michelle, while on a peacemaker delegation to Iran at the age of 23, said, "As Navajo people we are taught to take care of the earth, and in return she will take care of us, this is an ancient practice of ecological sustainability. If we violate the rules of nature, as well as the teachings of the Holy People they can discipline us, therefore we are taught to do whatever we can to maintain hozho. This is what the elders have said. The holy people, also taught us how to live, and not to consume too much of any resource, this teaching extends to oil consumption. Wars should not be fought for oil. Oil is like the blood of the mother earth." The paths of Living Well as an alternative to capitalism. Living Well in harmony with Nature is in essence the only possible universal way of life. Universal Declaration of Rights of Mother Earth to resist capitalism. Just like human beings are recognized in their rights, all beings must be respected in their rights under the Universal Declaration of Rights of Mother Earth, as an instrument to resist capitalism. Note: The estimated cost for each woman, Ofelia Rivas and Michelle Cook, for flights, lodging, food, taxi, etc. is $2,500, totaling $5,000. Please write Censored News, Brenda Norrell, brendanorrell@gmail.com in order to contact the women directly as sponsors. CONVINCED that as children of Mother Earth, our mission is the responsibility with Life according to what our parents and grandparents taught us. FEELING that the codes, understanding, knowledge and arts of the ancient peoples from the world were ignored by Western civilization and that now the world needs to rescue all the ancient and ancestral wisdom to restore balance and harmony to Mother Earth. AWARE that the most serious global threats facing us in the defense of life are related with climate change that threatens our own existence and Mother Earth, our water, our land and our forests, our food. UNDERSTANDING the validity and importance of the findings within the Peoples Agreement of the World People’s Conference on Climate Change and the Rights of Mother Earth, held in April 2010 in Tiquipaya, Cochabamba, Bolivia; and considering the need for an assessment of what we have achieved since then and the need to coordinate our different struggles and strategies for the defense of life. RECOGNIZING that Pope Francisco in the encyclical “Laudato if” (Thy Name Be Praised) delivered us a message that inspires us to continue our struggle, promoting care of the shared home through the union of the whole human family and the search for sustainable and comprehensive development, simultaneously taking care of nature and giving respect to the delicate balances among living beings that live in this world. UNDERSTANDING that Paris COP21 shall promote the signing of a new agreement on climate, so that we, the peoples of the world, have to raise our voices again to offer our own visions and solutions to climate change. REGRETTING that after more than 20 years we have not achieved to establish any meaningful international agreement on climate change, and the fact that in COP21 under the UN Framework Convention on Climate Change is intended to look as an agreement to pretend a global consensus and ambitious commitments from countries, hiding that in reality it does not want to affect the structural causes of climate change. CONCERNED about the misuse of technology to address the issue of climate change, like in geo-engineering and solar radiation, that on the contrary create enormous risks for Mother Earth, and transfer the solution to climate change to a technological approach and the wrong vision about the domain of humans above nature. ASSUMING that if we fail to build a universal culture of life, we will only contribute to the destruction of the future of our children and our children’s children. AWARE of the importance of finding and building joint spaces between leaders of social movements, academics, scientists, government officials and representatives from all continents to agree on proposals for COP 21 Paris and take our responsibilities for the health of our Mother Earth and our own lives. The agenda of capitalist interests against life. Transnational enterprises and capitalist interests endanger the health of the land, food, water and forests through actions that cause diseases, pests and death of living beings. Threats against life: Geopolitical wars of the empires to distribute our lands and territories. The military machinery of the North has been busy destroying entire villages in an effort to seize the strategic natural resources, feeding the financial architecture of capitalism and the industry of death. The paths of Living Well as an alternative to capitalism. Living Well in harmony with Nature is in essence the only possible universal way of life. Universal Declaration of Rights of Mother Earth to resist capitalism. Just like human beings are recognized in their rights, all beings must be respected in their rights under the Universal Declaration of Rights of Mother Earth, as an instrument to resist capitalism. Knowledge, practices and technologies of the peoples for climate change and life. Capitalism promotes modern technologies that come from the business and the private sector, Peoples should strengthen ancient and millennial technologies for life. The defense of our common heritage. The peoples strongly defend our natural resources and common heritage from those who trade with life in the name of protecting nature. Climate sciences at the service of life. In the face of misleading scientific reports from the Intergovernmental Panel on Climate Change (IPCC) about causes and impacts of climate change, we need to rescue and build our science about Climate Change. International Court of Climate Justice and Life. The world requires of an international organization to make us responsible for LIFE and with the fulfillment of commitments that countries should assume for its comprehensive protection. Mechanisms for non-commodification of nature. Capitalist countries have proposed internationally, market mechanisms as a cynic proposal to solve climate change, so we must promote mechanisms and instruments for the non-commodification of nature. Capitalism debts: climate debt, social debt and ecological debt. Capitalist countries have produced a set of debts to the peoples; humankind and Mother Earth and they must begin to pay, starting with the climate debt. Interreligious dialogue to save Mother Earth. The religions of the world struggle with a message of peace and dialogue, to solve the climate crisis, to the global capitalist system that destroys our community values. Evaluation of the achievements and advances of Tiquipaya and the peoples’ voice for the COP21 of Paris about climate change. Evaluate the Tiquipaya Conference and raise again our voice proposing our own solutions for climate change and the negotiations of countries in United Nations. To the peoples and social organizations of the world, it belongs us better and join all our forces, move from our towns to defend life and Mother Earth, rebuild the culture of life, the living well and the harmony with nature. – Organization of 12 working groups, one for each topic previously scheduled (first day in the afternoon and second day in the morning). – Intergroup plenaries (second day in the afternoon). – Presentation of results in general plenary (third day in the morning). – Discussion panels with topics to be defined. – Peoples fair for life, including expositions of participants about different subjects expressing their vision on climate change and the defense of life. – Performance of artistic and cultural expressions. The participation in the additional events will be with previous registration of interested people and acceptation by the organizers. – Twelve online discussion panels, one for each topic, with a moderator to organize the discussion on the preliminary document and inputs from the working group (September 15 to October 1).